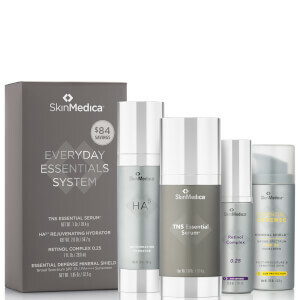 Promote a healthy complexion with the SkinMedica Award Winning System, a gift set containing three of the brand’s bestselling anti-aging products. The serum, moisturizer and pigment corrector work in harmony to protect skin against damage, smooth the appearance of lines and infuse the visage with a visibly youthful glow. An advanced, dual-phase anti-aging treatment consisting of two separate formulations that work in synergy to smooth the appearance of fine lines and improve overall tone and texture. Chamber one delivers age-defying effects to tackle wrinkles with stabilized vitamins and antioxidant-rich plant extracts, whilst the second chamber neutralizes free radical damage and traps moisture within the skin for maximum hydration. 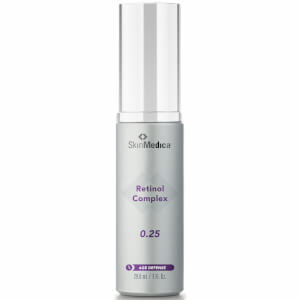 Blended together, the pair deliver a complexion that appears more refined and even, with visibly reduced signs of aging and a younger-looking vitality. 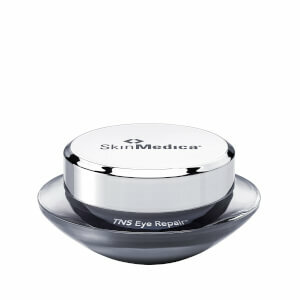 Address the appearance of stubborn skin discoloration with an advanced formula that is suitable for all skin types. Enriched with Tranexamic Acid, Phenylethyl Resorcinol and a Marine Extract Blend, the potent serum helps to support the skin’s melanin balance, encourage a healthy skin barrier and most importantly, visibly correct hyperpigmentation. Expect a bright, refined and healthy-looking complexion, as well as optimized results from treatments such as chemical peels and laser therapy. TNS: Before the first application lightly tap the top of the pump several times in the palm of your hand. Remove the cap and press on the very center of the pump to dispense both of the products onto the back of your hand. Blend the two products together and apply to the face, neck and décolleté. Use morning and night after cleansing and toning. HA5: Apply twice daily—in the morning and at night—after cleansing, toning, and treating your skin. Apply before you moisturize and apply SPF (sun protection). Apply to face, neck and décolleté, or any area where fine lines and wrinkles primarily exist. Because HA5 is a "water-loving" substance, wet your fingertips prior to applying HA5 to your skin. Lytera: Apply one pump twice daily after cleansing and toning the skin, in the morning and evening. Lytera® 2.0 can be applied to the entire face, neck, chest, or other affected areas. TNS: Human Fibroblast Conditioned Media, Water/Aqua/Eau, Cetyl Ethylhexanoate, Olea Europaea (Olive) Fruit Unsaponifiables, Alpha-Arbutin, Isoceteth-20, Arachidyl Alcohol, Glycerin, Ethoxydiglycol, Butyrospermum Parkii (Shea) Butter, Dimethicone, Tetrahexyldecyl Ascorbate, Dipalmitoyl Hydroxyproline, Palmitoyl Tripeptide-5, Ergothioneine, Hydrolyzed Sericin, Phospholipids, Ubiquinone, Rubus Fruticosus (Blackberry) Leaf Extract, Saccharomyces Ferment Lysate Filtrate, Aminobutyric Acid, Phytosterols, Tocopherol, Tocotrienols, Squalene, Oryza Sativa (Rice) Bran Wax (Oryza Sativa Cera), Sodium Hyaluronate, Tocopheryl Acetate, Camellia Oleifera Leaf Extract, Ethylhexyl Palmitate, Silica Dimethyl Silylate, Polyacrylate-13, Polyisobutene, Polysorbate 20, Behenyl Alcohol, Arachidyl Glucoside, Cetearyl Alcohol, Steareth-10, Steareth-20, Butylene Glycol, Maltodextrin, C12-15 Alkyl Benzoate, Xanthan Gum, Acrylates/C10-30 Alkyl Acrylate Crosspolymer, Aminomethyl Propanol, Disodium EDTA, Caprylyl Glycol, Caprylhydroxamic Acid, Ethylhexylglycerin, Phenoxyethanol, Potassium Sorbate, Parfum/Fragrance, Hydroxycitronellal, Linalool, Coumarin, Alpha-Isomethyl Ionone, Geraniol, Isoeugenol. HA5: Water/Aqua, Dimethicone, HDI/Trimethylol Hexyllactone Crosspolymer, Glycerin, Butylene Glycol, Bis-PEG-8 Dimethicone, Polysilicone-11, Sodium Acrylate/Sodium Acryloyldimethyl Taurate Copolymer, Sodium Hyaluronate Crosspolymer, Hydrolyzed Hyaluronic Acid, Sodium Hyaluronate, Vitis Vinifera (Grape) Flower Cell Extract, Vibrio Alginolyticus Ferment Filtrate, Alteromonas Ferment Extract, Porphyridium Cruentum Extract, Whey Protein, Plankton Extract, Trehalose, Urea, Serine, Algin, Caprylyl Glycol, Pullulan, Disodium Phosphate, Potassium Phosphate, Pentylene Glycol, Polymethylsilsesquioxane, Glyceryl Polyacrylate, Sodium Citrate, Sea Water, Sucrose Palmitate, Tocopheryl Acetate, Hydroxyacetophenone, Polysorbate 60, Propanediol, Potassium Sorbate, Citric Acid, Isohexadecane, Polysorbate 80, Silica, Decyl Glucoside, Tromethamine, Ethylhexylglycerin, Phenoxyethanol, Disodium EDTA. Lytera: Water, Butylene Glycol, Glycerin, Niacinamide, Polyacrylate-13, Phenylethyl Resorcinol, Tranexamic Acid, Vitis Vinifera (Grape) Flower Cell Extract, Plankton Extract, Tetrapeptide-30, Artemisia Capillaris Flower Extract, Vibrio Alginolyticus Ferment Filtrate, Alteromonas Ferment Extract, Tocopheryl Acetate, Polyisobutene, Polysorbate 20, Caprylic/Capric Triglyceride, Hydroxyacetophenone, Phytic Acid, Diethylhexyl Syringylidenemalonate, Disodium EDTA, Ethylhexylglycerin, Phenoxyethanol.